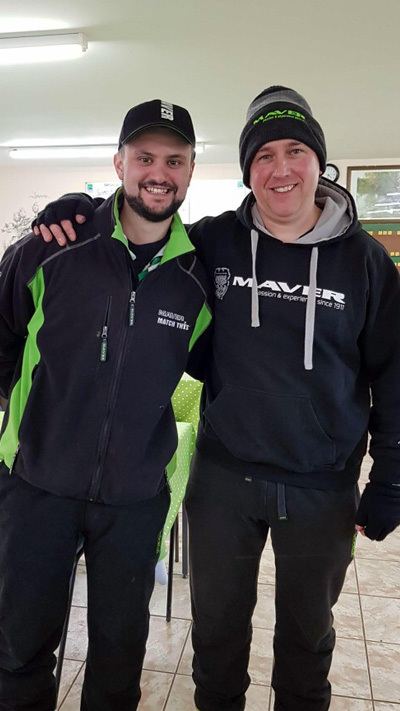 The Maver Harescombe squad have had a busy winter period fishing the Preston Innovations Woodland View Pairs Winter league with Team Captain, Andy Taylor entering three pairs into this extremely competitive forty four (44) man strong field. The seven-round series began in November and has seen the team collectively achieve a number of great results both individually and as pairs for the team overall. Throughout the series the Harescombe anglers recorded three individual wins with Ed Bryant winning rounds three and six, and Steve Brown winning round 4. Ronnie Pharoah finished the series off with a well deserved second place finish from round seven. There have been consistent lake wins throughout for Maver anglers Jason Powell, Mark Massey, Steve Brown & Ed Bryant leading to team pairs winning three rounds outright. Ultimately, this led to all three Maver Harescombe pairs still being in with a chance of finishing in the main frame heading into the seventh and final round, with only six points separating the three pairs and all being placed inside the top eight going into the final round. The series was capped off with a superb result for the whole team, despite the arctic like conditions, with four section winners including two overall lake wins. Steve Brown and Ed Bryant stole the advantage with Ed sealing a lake win with 42lb 12oz on Front Deans, and Steve taking third on High Pool with 45lb 10oz giving them four (4) points for the day. This was enoug to secure overall victory on the day, but also earned them the Winter League title finishing two points clear at the top with thirty one (31) points. Jason Powell & Robert Kerslake finished the league in sixth place with thirty seven (37) points after some fantastic results narrowly beating team mates Mark Massey & team Captain Andrew Taylor, who finished in seventh place with thrity eight (38) points. Well Done to the whole Harescombe team for a great winter campaign, and a special congratulations to Steve & Ed for their memorable win.